You are here: Home / Ethnic Groups / The People of Sumatra / Who are the Lembak? The Lembak live in the provinces of Bengkulu and South Sumatra. In South Sumatra Province, they live scattered throughout the entire region of Lubuk Linggau City. In the Bengkulu Province, they live in the Kepahyang and North Bengkulu regencies. The Lembak have many different names, depending on where they live. In Bengkulu Province they call themselves “Sindang Kelingi” or “Lembak Sindang Merdeka” (meaning ‘free’). In the Muara Beliti and Muara Kelingi areas, they call themselves the Saling people because they live by the Saling River. In the Karang Tinggi and Talang Empat districts the Lembak call themselves Lembak Delapan. It is said that this name emerged because they used to only consist of eight (delapan) villages. The Lembak family system is patrilineal with a bilateral (traced through both parents) lineage of descent. There are three common ways of living for newlyweds. First, they can live in their own home. Second is the bejojoh custom of living with the groom’s relatives. The third is the semendo custom of living with the bride’s relatives. The Lembak’s main source of livelihood is through cultivating rice. The women help work in the rice fields and also manage the household. Some Lembak are also coffee and rubber farmers. 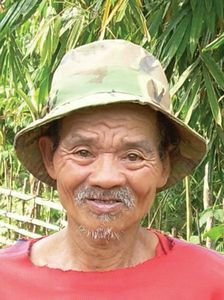 The Lembak rely on rubber farming more in order to support their economic needs. Rubber can be harvested daily to provide income for people’s daily needs. The Lembak sell various types of produce which are not sold by others in the area such as cassava leaves, guavas, bananas and more. The Lembak often give away their crop yields because they only grow them in small quantities and they would be ashamed to sell their produce to their own relatives. However, they are allowed to sell goods to each other in small neighborhood shops. Many Lembak also have small-scale brick-making factories in rural villages. There is a tendency for Lembak individuals to leave their homes to gain more work experience elsewhere. However, when leaving the home, there is an obligation of dua beradik which means two relatives must go with the person leaving. Most Lembak people have embraced Islam, although a large part of the community still adheres to animistic beliefs also. Most believe in the power of unseen spirits inhabiting sacred places. The services of a shaman are often sought for healing the sick, exorcising evil spirits, and for other reasons. In one notable case involving religious differences, there was an incident in which a Christian volleyball player’s house was burned down. It started with a volleyball match between residents and transmigrants. One player was a Christian. The residents were defeated and, not being satisfied with the outcome, they were angry and burned down the Christian player’s house. Even though the emotions of keen sporting competition was a factor, religious differences seem to have been the primary cause. The Lembak need to raise the standard of education and training for young people. This would help them qualify for better jobs. Raising their standards of practice for coffee farming will also help them to be more productive as coffee farmers.